I am very proud of my name. It is my grandfather’s — Nikita Khrushchev. 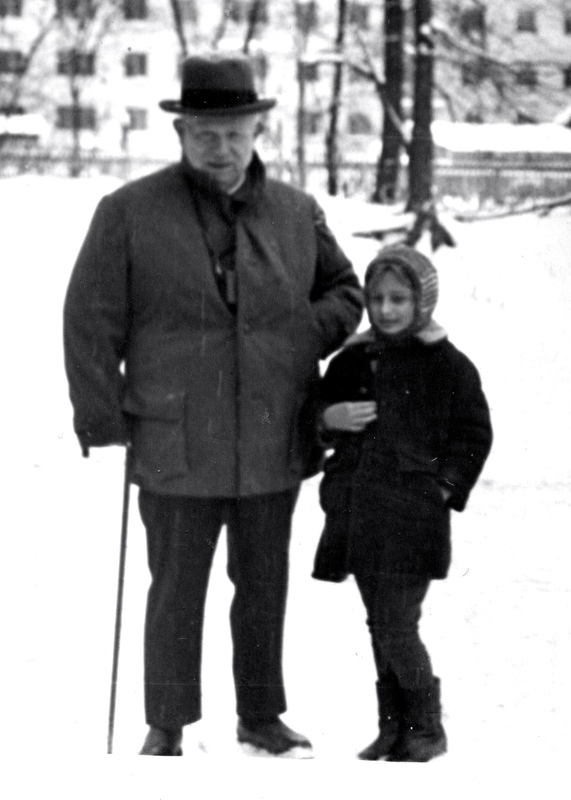 Here I am with my grandfather in 1971, in his retirement home in Petrovo Dalnee, 30 miles west of Moscow. There is just one problem with having this last name: Often people don’t talk to me, they talk to Khrushchev, the late Soviet premier. At times I become only a prop for their ideological idiosyncrasies or historical memories, like those cardboard figures — Nixon, Clinton or Schwarzenegger — that you take pictures with at an amusement park. Of course, I don’t object to being a professional Khrushchev once in a while. Responsibility comes with the name, and I am lucky to have it. Yet, also once in a while, anonymity is a welcome quality. At times, I think it would have been liberating to have your name not known, not recognized, not mangled. It would be great to have a name less terrifyingly foreign (or communist) to the American ear. Ann (N) Kay (K) is a pseudonym I’d like to have. Unparalleled in its basic simplicity, it is great name to have on the cover of a best-selling silly love novel, sold in every supermarket. I want to write it, but I never will — my Russian upbringing was too intellectual for that. I may never use this pseudonym at all. But here Ann Kay may get a chance to test my alternative personality. Not that my personality isn’t alternative as it is. When I explain our multilayered family relations, people often get lost in its complexity. And I am, too, lost in trying to explain it clearly and succinctly. Russia after all is an enigma wrapped in mystery, and my family is no exception. 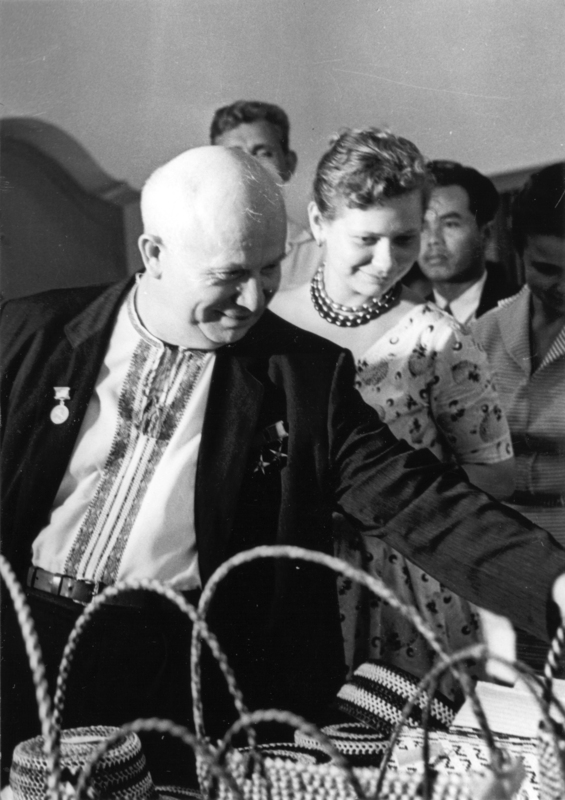 Khrushchev, the Premier, is actually my biological great grandfather. But when his eldest son, Leonid perished in a World War II air battle over central Russia, Nikita adopted Leonid’s two-year old daughter, my mother Julia, as his own. Julia, his granddaughter by birth, became his daughter by relations. Consequently, by relations Nikita Khrushchev is my grandfather, and I always refer to him as such. Photo Left: My grandfather and mother inspect arts and crafts during Soviet state visit to Indonesia in 1959. Photo Right: Leonid Khrushchev (1917-43) in Moscow during World War II, 1942. For his anti-Stalin reform policies the premier became persona-non-grata in the 1960s USSR around the time I was born. When I grew up, my political consciousness had grown too: In the early 1980s, with Leonid Brezhnev running the Soviet show, I myself decided to adopt Khrushchev. To show my affinity with my grandfather, I chose to give up my father’s surname, Petrov, and to take that of my mother’s, Khrushcheva. 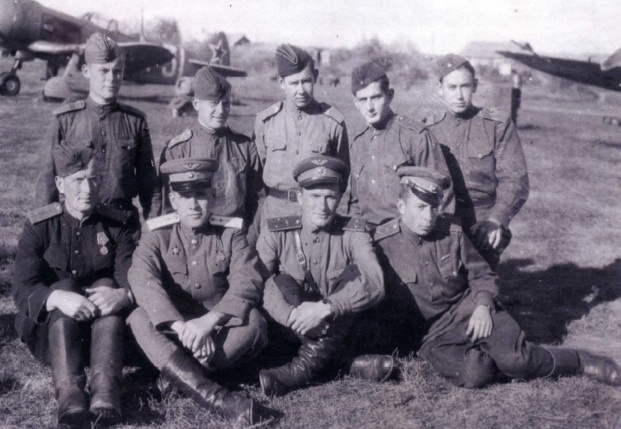 My father Lev Petrov, second top right, was also a soldier in World War II. Pictured here in 1941, he was 18 when the war began. He passed away in 1970 at the age of 47, and it was a terrible loss for me as a small child. Yet growing up, I felt that he didn’t need as much of my public memory, as my grandfather did. However, since then, in homage to my father, I always use my middle initial – L – for Lvovna, my Russian patronymic based on his first name, Lev. Indeed, we don’t, and for now I remain Nina L. Khrushcheva. As such I have written a memoir, The Lost Khrushchev (Tate Publishing, May 2014), the year of my grandfather’s 120th birth and 50th anniversary of his ousting from the Kremlin. It has taken four years to cohere this three-decades-coming-of-age story into a book. Rewriting it three times, probably the hardest thing I have ever done. I had to put together a somewhat comprehensible picture of Soviet history, to explain my grandfather’s reformist political legacy, despite his loyalty to Joseph Stalin before the dictator’s death in 1953. I had to address the rise of Vladimir Putin, and most importantly, I had to unravel deeply convoluted relations within the Khrushchev family. The Lost Khrushchev: A Journey Into the Gulag of the Russian Mind is a family chronicle that tells the story of Leonid Khrushchev, my grandfather, and the oldest son of former Soviet premier, Nikita Khrushchev. Part memoir, part investigation, this book is a window into Leonid’s life and death – and what they mean for contemporary Russia. It is inspired by the persistent accusations in the Russian media that 25-year-old Leonid – a fighter pilot during World War II, the Great Patriotic War in Russia – did not die heroically in battle in 1943 as was once presumed, but instead was executed by Joseph Stalin for his alleged service to the Nazis. So what happened to that lost Khrushchev? Was Leonid really a deserter? Or did he, like 20 million other Russians, lose his life during the war? Throughout this book, I also address the legacy of my great grandfather, Nikita Khrushchev, whose leadership from 1953 to 1964 still has much bearing on Russian politics today. In October 2014, Peter Baker of The New York Times and I spoke about Vladimir Putin’s presidency and The Lost Khrushchev at my home university, The New School. October 13, discussion of The Lost Khrushchev with Jeffrey Sachs, Director of the Earth Institute, at Columbia University. July 10, an awesome review of The Lost Khrushchev in The Economist, Lost in Translation: What Happened to Nikita Khrushchev’s Son? So honored and grateful! June 29, a conversation with Radio Pacifica’s Ian Masters of Background Briefing. June 23, I talked to Mark Barton of Bloomberg about Ukraine and about why Russia is always Russia–the Gulag of our minds. June 13, Radio Free Europe Radio Liberty’s podcast on my book. Thank you Brian Whitmore, the brilliant author of “The Power Vertical” blog! In May 2014, coinciding with the book’s publication, Newsweek has run excerpts from the book: 1. Khrushchev. Hero or Villain; 2. A Breath of Fresh Air in the Kremlin; 3. Once KGB Agent, Always a KGB Agent. In February 2013, I spoke about The Lost Khrushchev at The New School — it was a horrible blizzard that day, still didn’t stop almost 200 diehard downtown liberals and Cold Warriors from attending. I am grateful for their interest and attention. I so enjoyed your interview today on All In on MSNBC – thank you for your great insights! Great blog and lovely picture. Nikita Khrushchev was a hero. I wrote a lengthy and provocative blog post on the Soviet Union and Marxism if anyone is interested. However I don’t feel Khrushchev was ousted for his anti-Stalinist views but was deposed by the armed forces because of his excessive antagonisms towards the Soviet Army whose support he was largely dependent on. Pingback: Dash of Insight | 2014 in Review: Hot or Not?